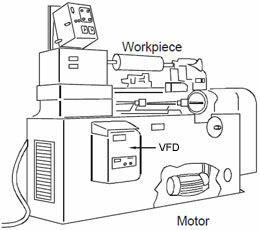 Variable Frequency Drive (VFD) can be used in lots of fields. Variable frequency drives are widely used to control the speed of AC motors, like conveyor systems, blower speeds, pump speeds, machine tool speeds, & other applications that require variable speed with variable torque. In some applications such as speed control for a conveyor, the variable frequency drive is installed with a remote potentiometer that personnel can adjust manually to set the speed for the conveyor. 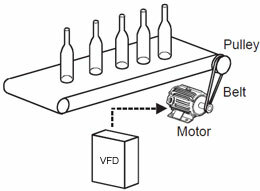 In this type of application, the personnel who use the conveyor can manually set the motor speed with the minimum & maximum frequency that is programmed into the variable frequency drive parameters. Following tables will guide you the general purpose VFD and vector VFD applications. Variable frequency drives realize energy saving and automation. Useful for air flow control (flow amount control). Automatic control over air flow (pressure or flow amount). Necessary amount can be changed according to seasons and day/night. Higher machine efficiency and downsizing of machines. Conventionally, the rotation speed of a main spindle was controlled by changing the speed of a pulley, etc., according to the size of a workpiece. Using variable frequency drive makes such speed change system simpler, allowing downsized machines. The most suitable machining conditions are easily obtained. Drive for a main spindle of a machine tool. Table of a machine tool Spindle stock feed. 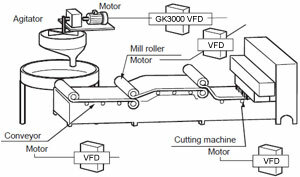 Higher machine efficiency, defined position stop, automatic operation. The operation efficiency can be improved and carts can be stopped at the defined position. The conveyor speed can be changed to the most suitable value according to the workpiece. The soft start and stop realizes preventing products from falling down and wobbling. 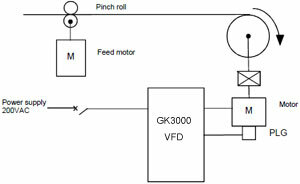 Shocks to machines are absorbed and the acceleration and deceleration without shocks are realized. Even for loads that change (increase) their viscosity as the speed decreases, operations continue without torque shortage. Higher machine speed enables higher machine efficiency. Carts can be stopped at the fixed position. 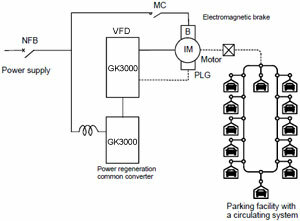 Multilevel car parking towers with a circulating system may need a large starting torque depending on the imbalance amount of the automobiles parked. The vector control VFD is suitable for such applications. A negative load may be generated depending on the number of automobiles parked, requiring a large brake torque. In such cases, use a vector variable frequency drive with the power regeneration common converter (optional) to construct an efficient driving system.